In a year where entertainment fans have lost so many legendary artists, one more icon has passed away just before we ring in the new year. Unlike most of this year's late legends, this artist was not a household name, although his work had a major impact on some of the most revered films of all time. 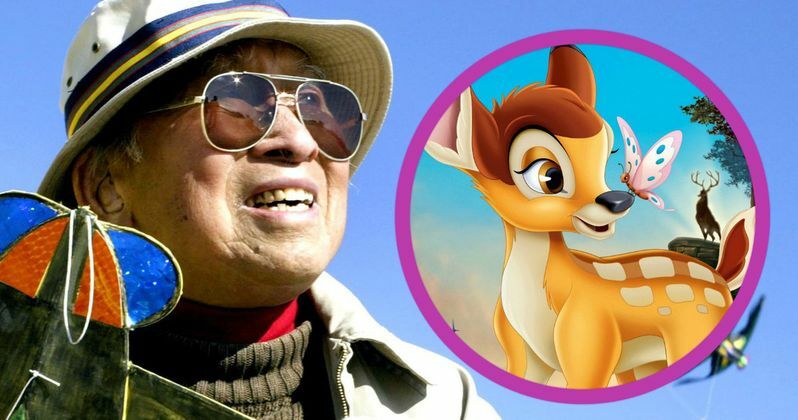 Artist Tyrus Wong, whose work helped shape the unique look for Bambi and many other films, passed away yesterday at the age of 106. Deadline reports that the artist's family confirmed the news of his death on Facebook, although no further details were given. The artist was born October 25, 1910 in Taishan, Guangdong Province, China, before he emigrated to San Francisco with his father in 1919. He received a full scholarship to the Otis Art Institute, and upon graduating in 1930, he immediately started working in the Hollywood studio system as an artist. Here's an excerpt from the Walt Disney Family Museum blog, which reveals how the late artist's work helped influence the Disney classic Bambi. "In 1938, Wong said he 'needed a job.' It was at that time he began at Disney as an "inbetweener," drawing hundreds of sketches of Mickey Mouse. When he heard that the studio was in pre-production on the feature film Bambi, he went home and painted several pictures of a deer in a forest. The small, but evocative sketches captured the attention of Walt Disney and became the basis for the film's visual style. Walt Disney saw that Tyrus was able to produce exquisite artwork that did not necessarily look like the forest-but rather, felt like the forest. Walt's vision for Bambi and use of Tyrus' work still influences films today. From Disney, he headed to nearby Warner Brothers, where he worked as a concept and story artist for the next 26 years until retiring in 1968. After retirement he began designing and building hand-made kites. In 2001, Tyrus was named a Disney Legend, and his work has continued to inspire and influence the leading animators of today." During Tyrus Wong's stint at Warner Bros., he worked as a concept and story artist on hit films such as The Sands Of Iwo Jima, Rebel Without A Cause and The Wild Bunch. Nelson Coates, president of the Art Directors Guild, revealed that the union is planning a tribute to the revered artist during the ADG Awards this coming February. Here's what he had to say in his statement below. "On behalf of the Art Directors Guild, I am very saddened to share news of the loss of our highly talented friend, Tyrus Wong. His work and life inspired so many of us with his passion, originality, and creativity. Deepest condolences are extended to his family and many friends at this time." After his work in Hollywood, Tyrus Wong would go on to create and design greeting cards for Hallmark, and he would later create elaborate custom-made kites. He would often be seen flying these kites, which were usually shaped like animals such as pandas, goldfish, or centipedes, at the Santa Monica Pier in Santa Monica, California. He was also the subject of the 2015 documentary Tyrus. Tyrus Wong was preceded in death by his wife Ruth Ng Kim, who passed away in January 1995 at the age of 85. Tyrus Wong is survived by his three daughters Kay, Tai-ling and Kim. The Lion King and Bambi Blu-ray Trailers!